I spent hours and hours trying all different ways of beating this level without success. I tried using every tower available but nothing seemed to be working for me. I thought this level was going to beat me. I came to hate those pink squids. No matter what I did they’d freeze up all my towers allowing other enemies to get through. I was about to give in when I realised that the splash towers were causing the most damage to the enemies. That’s when I tried ONLY using splash towers, I completed the level on my first go. Make two lines of splash towers and get them fully upgraded. It’s that easy. http://twitpic.com/67bda6 <— PROOF. xD LOL! Thanks again! oh my GOD!!! THANK YOU!! Does not work for me. I still die. Play the level on x1. Start from near the base and work from right to left. What difficulty level are you trying this method on? Thanks!!! Have been trying for almost a week and even tried a couple other tutorials, yours worked the first time! I’m glad it worked for you. Thank you for taking the time to write about your success. WOW!! THANK YOU A TON!!!! I’ve been trying for daysssssss on vulcan. I use the splash tower too.. but not to that extreme. Let me try…..
Now I’m stuck at the next level. Hehe. Oh my goodness! Thank you for sparing my sanity! It absolutely works! More towers is better than fully upgraded towers, just in case the pink blobs explode. 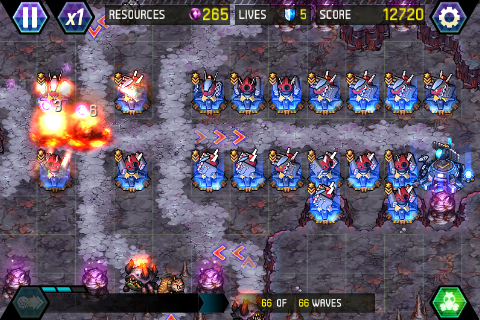 Fully upgrade the towers closest to your base, as they are your last defense, then move out. Worked on hard. No loss of lives. I also targeted the blobs as they were coming out so they only Hurt my front defenses. Perfect … It works !!! Thanks – I thought this was going to defeat me as well. My previous attempts had concentrated on splash towers but then had too many other towers rather than upgrading the core towers. Sorry, but I’ve tried this strategy time and again and still come up buggered. This didn’t work for me entirely. I still lost half my lives. I ended up needing to place a focus tower on the far left hill, two scout towers and a focus tower on the far right hill, and two rocket towers on eithr side of the bottom two paths. Scout towers were fully upgraded. Still lost half my lives, but I wound up losing them all relying solely on splash towers. By the way, this guide is amazing. It’s saved me so many times. Without it, I’d still be stuck back in b. Thank you!!! I’m glad that someone is finding the guide useful. Did you check out the YouTube video on how I beat this level? I know that on some levels the pictures need updating to reflect the solutions found on the videos. Splash towers are 200% under rated. Seriously, it’s like you can beat levels you never beat before by simply using Splash towers exclusively. AHHHHHMAZING!!!!! Thank you! !1 Thank you!!!! thank you!!!! Hi, I got hooked with TD after my husband downloaded it for tthe Ipad. I usually play all levels in easy, in higher difficulties. Vulcan is the first that beat me… I got stuck on this level for almost two days! I tried all the combinations I could think off, and even tried something like this, but it did not work THANKS so much! Vulcan was making me to leave play this game. But i have tried your “splash towers” method and get succes at first time! thank you very much!!!!!! . I haven’t realised that these towers kills more than one enemy in every shot! that’s the trick!!!!! If you'd like to help support my work on this blog, I'd be happy to accept any donations.